The Archbishop of Trani-Barletta-Bisceglie, Mons.Giovan Battista Pichierri Has Passed away Unexpectedly. Dear friends in the Divine Will, this morning, the Archbishop of Trani-Barletta-Bisceglie, Mons.Giovan Battista Pichierri left unexpectedly for the Father’s house. The funeral will take place at 4:00 p.m on July 28 at the Cathedral of Trani. We are waiting to hear more news. Meanwhile we want to express on behalf of the members of the Association Luisa Piccarreta Little Children of the Divine Will in Corato and of the whole “Family of the Divine Will” in the world our thanks to God for all that He gave to us through the love and care of this Shepherd. He has always accompanied, encouraged and supported us. May the Lord give him the reward of the “faithful servants”! We are certain that Luisa will welcome Him in Heaven and lead Jesus to Jesus. Let us pray for him in the Divine Will. and then, how much he did for Luisa and the little family of the Divine Will and how much he suffered. and who will work fervently to establish the Reign of Your Kingdom on earth as it is in Heaven. Bind him to Your Holy Divine Will and seal all his works with the Divine Seal. Known, Loved and Possessed by all. and that It may keep him sheltered, protected from all dangers and free from all evils. 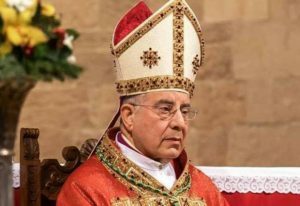 We inform you that the funeral of our Archbishop will be broadcast live on Teledehon at 3:45 p.m. (channel 18 and hd on 518 for Puglia). You can also follow the funeral ceremony in streaming on the website www.teledehon.it and http://www.coratolive.it/.In the meantime, yesterday morning the body was transferred to the parish of St. John where at 1:00 p.m. today, the clergy will gather to celebrate the Little Hours. Later, the coffin will be accompanied to the Cathedral of Trani where at 4:00 p.m. there will be the Solemn Concelebration presided over by Cardinal Salvatore De Giorgi.